Imagine a system that provides a whole education for the mind, body and heart to flourish in today’s learning environments. 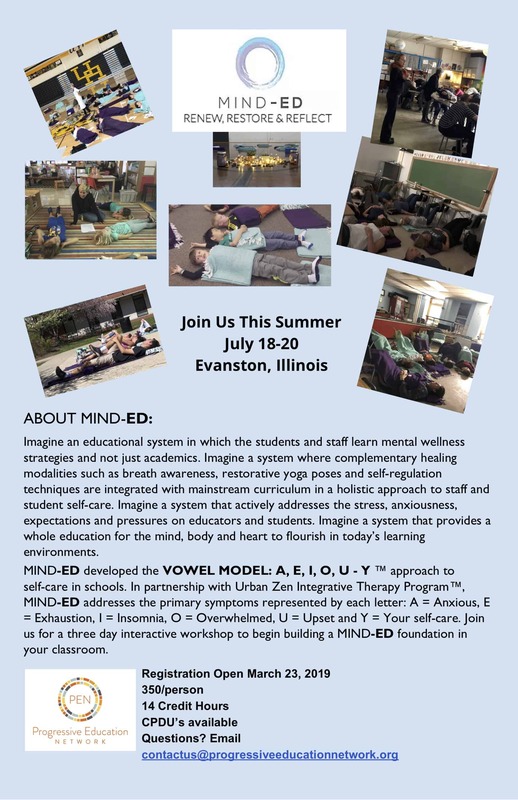 Join us for a three day interactive workshop to begin building a MIND-ED foundation in your classroom. SHARON COLLAROS Sharon is a co-founder and program director for MIND-ED. She believes the gentle practices and benefits received from the reflective quality of Urban ZenTM nurture a compassionate conscience desperately needed in 21st Century living. She is a yoga teacher who specializes in Urban Zen Integrative TherapyTM and Laughter Yoga and has a deep passion for I-Rest. Sharon currently works in schools as an Urban Zen Integrative TherapistTM and teaches meditation. She also takes the gentle practices of Urban ZenTM to The Church For All People, where she works with the social workers as well as the homeless and underserved population. SABRINA DE LIBERA WALTERS Sabrina has been teaching at Wickliffe Progressive Elementary (K-5) and Jones Middle School in Upper Arlington for more than 25 years. Sabrina earned her Master’s degree in Early and Middle Childhood from The Ohio State University. She holds a Certificate of Applied Positive Psychology from the Flourishing Center and is an Urban Zen Integrative TherapistTM and a meditation teacher. She enjoys the energy on and around her yoga mat and uses her UZITTM practice to help navigate and embrace the joys, changes and new discoveries that life offers. Sabrina is a co-founder and education director for MIND-ED. SUSAN KEISTER Susan is co-founder and Social and Emotional Learning (SEL) specialist for MIND-ED. She has dedicated her life to creating compassionate learning communities and cultivating social and emotional competencies in adults and students in schools. She holds an M.A. from Michigan State University and serves as a SEL Specialist for Lions Quest Program of Lions Clubs International and the Collaborative for Academic, Social, and Emotional Learning (CASEL). She taught middle and high school for ten years and has since developed SEL curriculum and facilitated professional learning for over 35 years in 40 countries internationally. She is a certified Urban Zen Integrative Therapist, holistic coach, meditation teacher and restorative practices facilitator. JR RICHARDS Co-founder and CFO of MIND-ED, JR earned his degree in Telecommunications from Ohio University and holds a Master of Business Administration (MBA) from Franklin University. He has worked in Information Technology for over 25 years. His interest in yoga and meditation began with a Rodney Yee video to complement his P90X workouts. JR completed meditation teaching training at Yoga on High in Columbus, Ohio. ESSENTIAL QUESTION: In what ways do integrated mindfulness practices impact the culture and climate of my life, the lives of my students, our classroom and our school community? I am able to experience guided meditation for body, mind and heart connection. I am able to develop a self-care plan for myself. I am able to model mindfulness strategies. I am able to share mindfulness research and resources. I am able to create an MIND-ED action plan for my learning environment.